Biomedical Engineering Assistant Professor Daniel Gallego-Perez has won a National Institutes of Health (NIH) Director’s New Innovator Award. The NIH announced 89 research grants from its High-Risk, High-Reward Research Program today. The program catalyzes scientific discovery by supporting compelling, high-risk biomedical research proposals that may struggle in the traditional peer review process despite their transformative potential. Program applicants are encouraged to think outside-the-box and to pursue creative, trailblazing ideas in any area of research relevant to the NIH mission. Gallego-Perez (center) demonstrating TNT technology in his lab with Asst. 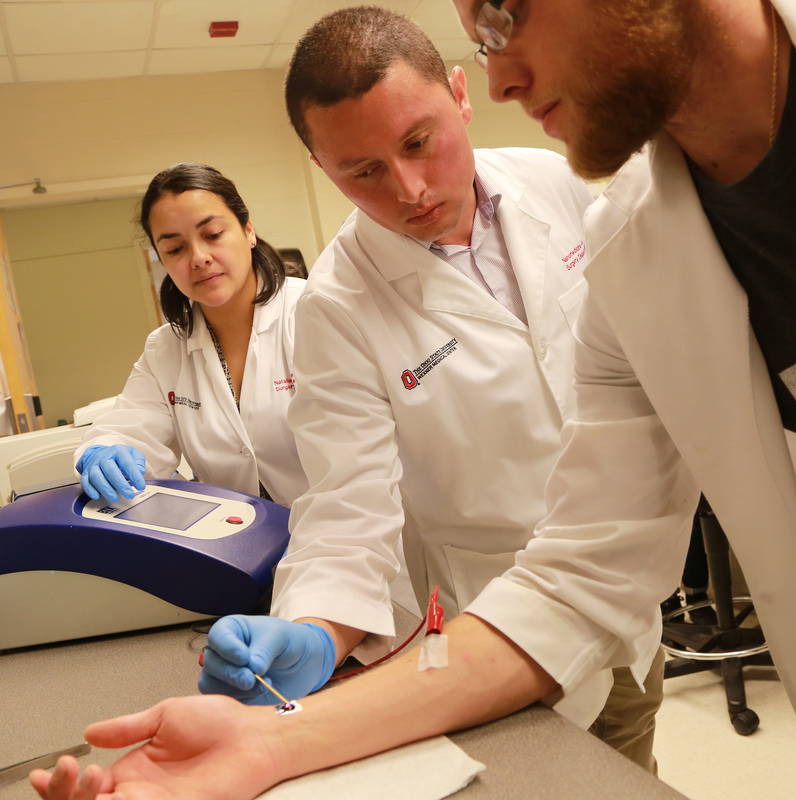 Prof. Natalia Higuita-Castro and former graduate research assistant Alec SunyeczGallego-Perez will use $2.3 million in total funding to build on earlier studies that demonstrated how tissue nanotransfection (TNT) can convert skin cells into blood vessels and nerve cells. Results of that regenerative medicine study appeared in the journal Nature Nanotechnology. The novel approach under development may be used to repair injured tissue or restore function of aging tissue, including organs, blood vessels and nerve cells. He will leverage this award to expand on ongoing collaborations with a number of faculty at Ohio State, including: neurologist Dr. Stephen Kolb, director of the ALS/Motor Neuron Disease Clinic and Translational Research Program in Ohio State’s Wexner Medical Center; Dr. Cameron Rink, interim director of the Center for Regenerative Medicine and Cell-Based Therapies; and Dr. Ian Valerio in the Department of Plastic Surgery, among others. The research team also will include biomedical engineering graduate and undergraduate students. While this grant will support animal studies, Gallego-Perez said that data resulting from the work will be fundamental to the team’s pursuit of human clinical trials in the future. NIH’s New Innovator Award, established in 2007, supports unusually innovative research from early career investigators who are within 10 years of their final degree or clinical residency and have not yet received a research project grant or equivalent NIH grant. Gallego-Perez earned his PhD in biomedical/medical engineering at Ohio State in 2011. He then served as a postdoc researcher before becoming a faculty member in 2015. Ohio State’s TNT platform technology overcomes many barriers that can interfere with other cellular reprogramming methodologies. It is non-invasive, and since it doesn’t rely on viral vectors to deliver genetic material into cells, immune response is mitigated. TNT technology has two major components: First is a nanotechnology-based chip designed to deliver cargo to adult cells in the live body. Second is the design of specific biological cargo for cell conversion. This cargo, delivered by zapping the device with a small electrical charge barely felt by the patient, converts an adult cell from one type to another. Previous mouse studies show this nanotechnology-based approach promotes remarkably fast and efficient whole tissue reprogramming in vivo.